I recently got the question: “Why do dialysis patients sleep so much?” Some patients would answer that question with another: “What are you talking about?” because we often have sleep disorders like insomnia. I wrote about “Dialysis and Insomnia” because so many of us share that. I also wrote about “Dialysis and Sleep Apnea” because that’s another issue we often share. The short answer to the question is: “Because we often have problems sleeping”. But, that’s hardly an answer, is it? The longer answer is: “There no specific reason.” Wait! That’s not longer. How about because we are tired for a number of reasons including insomnia, sleep apnea, general lethargy, medications, boredom, relief from pain, etc. There are some patients that can fall sleep almost before the needle stick! Wow! Must be nice. And, there are some that sleep through almost all their dialysis treatment. I can’t. If I do sleep, it’s only for a few minutes. My record is almost an hour. Whoopie! Sleep is extremely important but, alas, far too many of us have problems with it. I’ve talked with a lot of patients about this and many don’t take any sleep medications (some because they can’t). A typical pattern is that they sleep for a couple hours, are awake for a couple, then repeat this cycle until it’s time to go to dialysis. My concern is that they are not getting enough proper sleep; an eight hour sleep cycle. 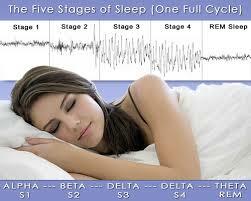 See the image above for information about a complete sleep cycle. It begins with Alpha Sleep and finishes with REM Sleep during which we dream and process all the information from our waking hours. If we don’t sleep long enough, we don’t complete the cycle and we feel sleep-deprived the next day. I’ve found that using a sleep medication helps me. I’ve been taking them for over four years. I sleep all night through and with few side-effects. However, I had the chance to experiment by not using those (mostly because I’m between insurance providers and medications are in short supply or I have to pay full price for them and I can’t afford it.) I didn’t sleep well last night without them. I woke up several times and didn’t feel like I got a full night’s sleep. Although I took my sleep medication, I’m up in the wee hours of the morning now as I write this post. I woke up at 3:30 a.m. and couldn’t get back to sleep. So, I sit at my computer and write. I suspect it may be a bad batch of generic medications. The manufacturers of generics are not the most reliable group as I posted in “Dirty Medicine“. A friend of mine was telling me about her sleep cycle and it’s very much like mine, too. She goes to bed about midnight and awakens at 3 or 4. I’ve talked to others with a similar pattern. Unfortunately Medicare Part D (that I’m currently on) doesn’t pay for any of my sleep meds. I’m new to this because I changed nsurance plans last month. They sent me a letter that said they’d pay for one prescription refill but no more. So, I’m not sure what I’m going to do about sleeping. And this fact, may explain why so many dialysis patients have sleep problems; they can’t get them because they can’t afford them and Medicare won’t pay for them. But, I wanted to address this issue and I’ll add more to it as I discover more about it in the coming months. It’s obviously going to be a real problem! This entry was posted in dialysis, New Patient, Restless Leg Syndrome, Sleep Apnea and tagged dialysis, ESRD, hemodialysis, kidney, Sleep Apnea, sleep disorders, treatment. Bookmark the permalink. Thank you! I loved this article! THAT is why I am always so tired even after dialysis!! Hi Devon. Recently (2 weeks ago) I actually fell asleep standing up at home as I woke in the middle of the night (as usual) and walked to the washroom and when I came back out I stopped for a moment thinking and next thing I knew I hit my knee very hard and the side of the knee cap is very bruised (wasn’t at first or the next day but boy now it is very noticeable) and then my chin and head and hand. I told my nephrologist on rounds in dialysis the next day and he didn’t seem too concerned. Then a few minutes later the pharmacist came in and told me to stop taking my sleeping pills. I told him I had just picked them up from the pharmacy and haven’t even taken one yet. Still that is as far as my care went when it came to my sleep. I am left to guess what is going on alone and so thinking a lot about it I think I am not getting good sleep at night because my restless leg syndrome is so bad my legs flail about. Even though I don’t always get woken up by them (I am told) I imagine that perhaps they do interfere with my sleep. Also if I go to bed at midnight I wake up by 3 or 3:30am. I have only had the restless legs since starting dialysis. Even 2 weeks later when I showed the same Nephrologist my bruised knee he still was not concerned and said to put heat on it to make the bruise go away (I had put ice on it for the first few days after the bruise showed up). Have you ever heard of any dialysis patients who ever fell asleep standing up? Similar thing happened to me. Got up in the middle of the night, woke up on the floor with bruised knee. Fortunately i had a Blood Pressure device. I checked my BP and it was very low. I was taking my hypertension med before bed and during the night I was going into low blood pressure but as I was sleeping, I didn’t know. I decreased the dosage at the suggestion of the doc and changed when I took them. I also carefully monitored my BP for the next seeveral weeks and reported this to the doc who lowered the dosage more. Long story short. Perhaps you had an episode of Low BP?